May 5, 2016 marked the graduation of Bravo!Pup’s Talent 3 advanced performance class. Taught by the amazing Sandi Thompson, the class wasn’t primarily about learning new tricks. Not that new material wasn’t taught, it was just that everyone in that class walked in with a pretty good repertoire, so the focus was on polishing performance behaviors until they shined. 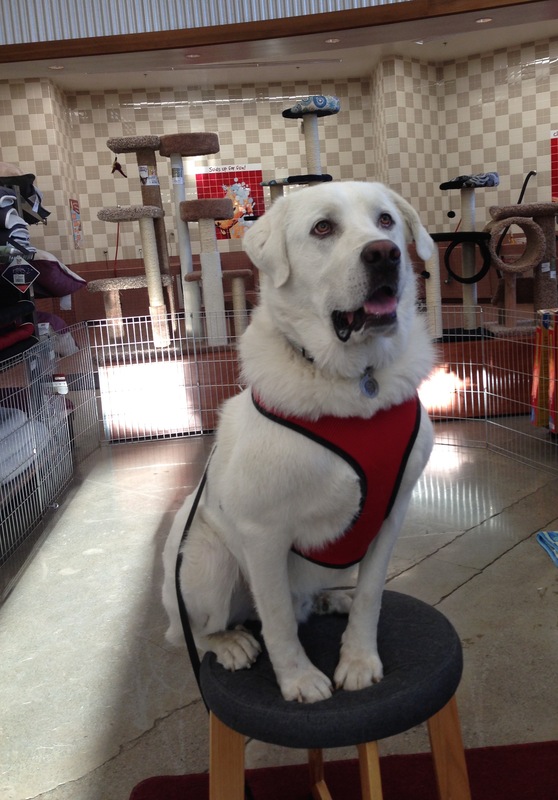 During the class, Klondike improved as performer, and had a great deal of fun. In fact, we are thinking about changing his name to The Thump because of the non-stop, super strength, full contact tail wagging he’s started. I think this happiness came from a combination of training treats, attention, the strengthened bond that comes from working closely with your best friend during training/rehearsal, the class’s location inside a Pet Food Express store (a favorite Klondike destination) and the positive energy in the room. But whatever the reason, we’re grateful for the experience. It was also a blast for the bipedal participants, who greatly enjoyed spending time around their own kind (human and dog) and exercising a shared passion for dog training. Last week marked the first meeting of Performance Three from BravoPup! The class is about learning more tricks, and polishing the current repertoire, getting the behaviors bigger, better, crisper and (most importantly) controllable at a distance so the trainer can reliably work with the dog while staying behind the camera or off stage. The class is taught by Sandi Thomas, who as master dog trainer and former professional actress, truly understands what it takes to perform successfully. The other dogs in the class, Harley, Isabella, Brian and Sassy, had the technical skills of an Olympic figure skater, just nailing their behaviors perfectly. I’m pretty sure Mr. Klondike can get there, or at least get close, but we sure have our work cut out for us! Mr. Klonbeast Is Too Excited To Sleep! In exactly one week, seven days from now, Klondike starts BravoPup’s invitation only advanced performance (tricks) workshop, Performance Three. And what to do? As Summer performance season rapidly approaches, should we polish up last year’s show, Klondike’s Fire and Earthquake Safety Symposium ? Do something totally new? Klondike has always wanted to record a collection of his acoustic numbers with the London Philharmonic. He could start practising for that. But whatever the workshop turns into, we’ll be sitting in grand style, because the Klondike performance stool has been upgraded. The old stool worked fine but… to keep it stable when Klondike jumped on, jumped off or stood up on it I had to stand on the piece of plywood screwed to the bottom. Functional, yes, elegant no. Jan then brought in Ian, the friendly machinist (and retired Red Cross rescue supervisor) next door, and vola! 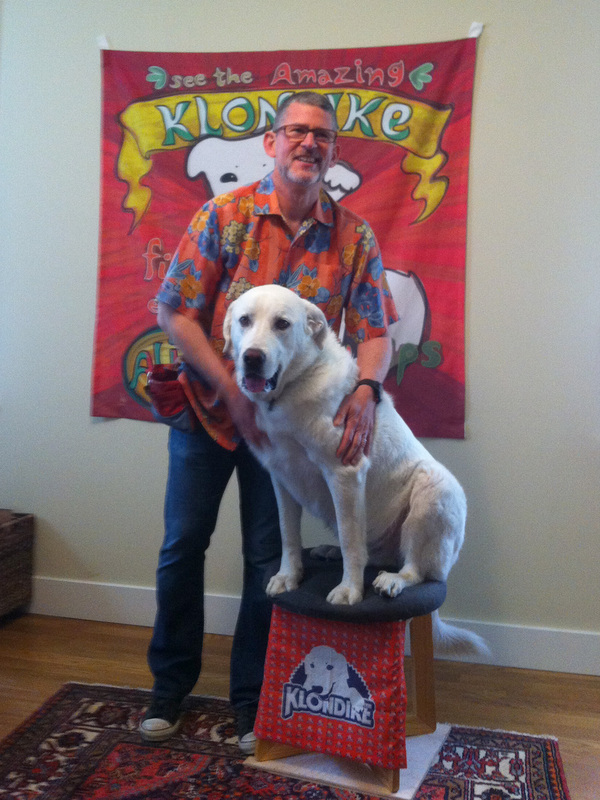 The new Klondike stool! The new stool features an extra heavy base for stability (no more using my foot!) and quickly disassembles at both base and platform for easy transportation. 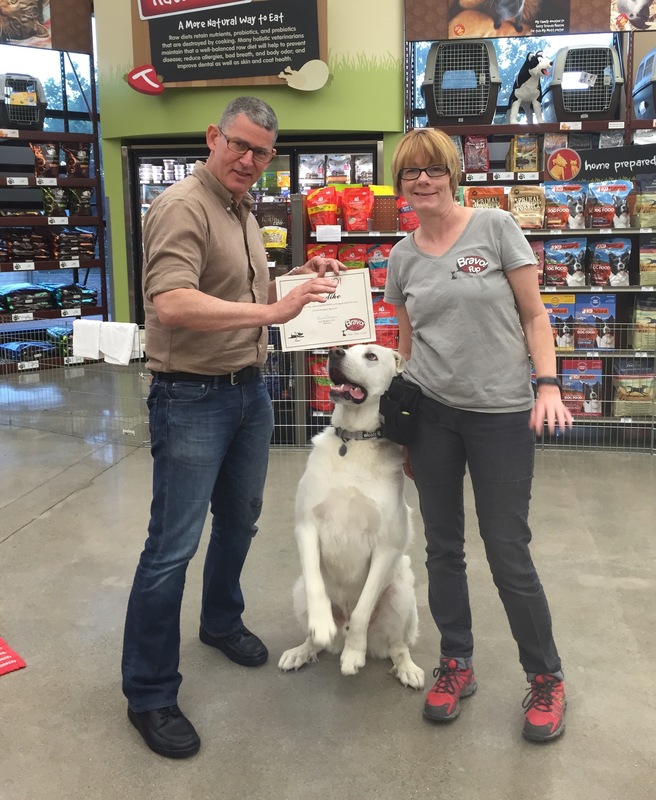 Klondike jumps for joy as Sandi Thompson of Bravo!Pup presents Klondike’s diploma, officially certifying him as a Super Star. 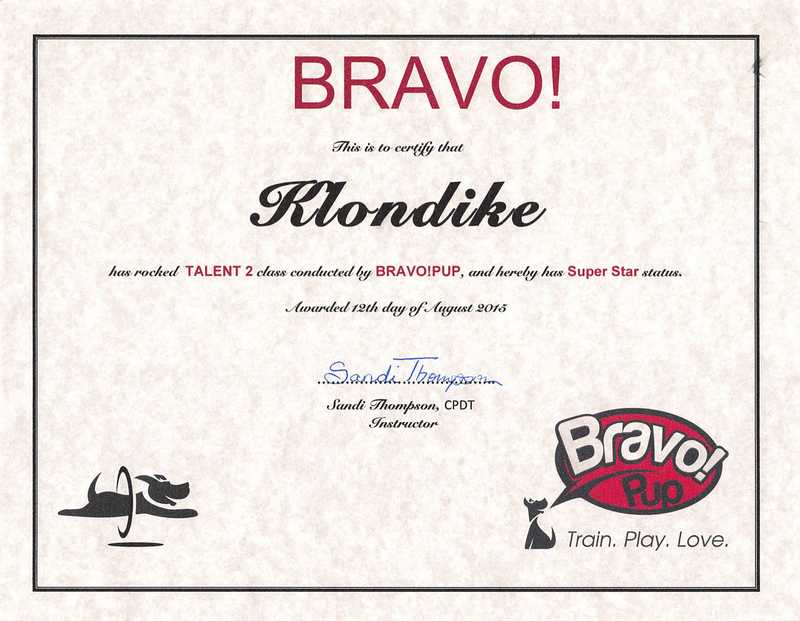 Klondike never tires of honing his craft and worked his tail off to get Super Star status in Talent 2, a second level tricks class run by the always awesome Bravo!Pup. 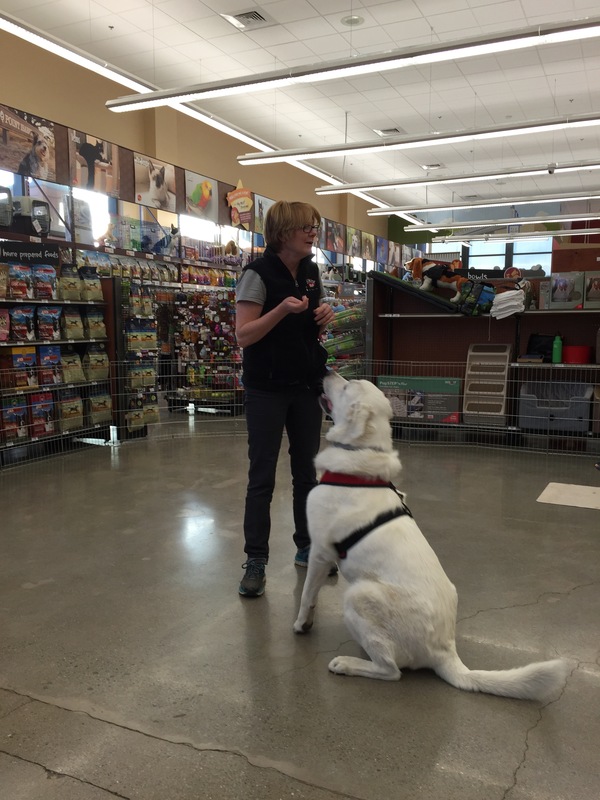 There’s no doubt that Klondike loves training class. On the way to to class he may lay lazily on the backseat of the car, but coming back he’s sitting fully upright and in full sniff mode. And for a day or two after training class there is definitely a little bit of extra spring in his step and perhaps a bit more assertiveness in the demands he puts on his staff. But Klondike’s life isn’t just the hard work of training. This is Klondike playing with a smaller dog at a local park. It’s really interesting (and kind of a source of pride for me) to see how gently Klondike adopts his playstyle so as not to hurt or overwhelm a dog probably fifty pounds lighter than himself. 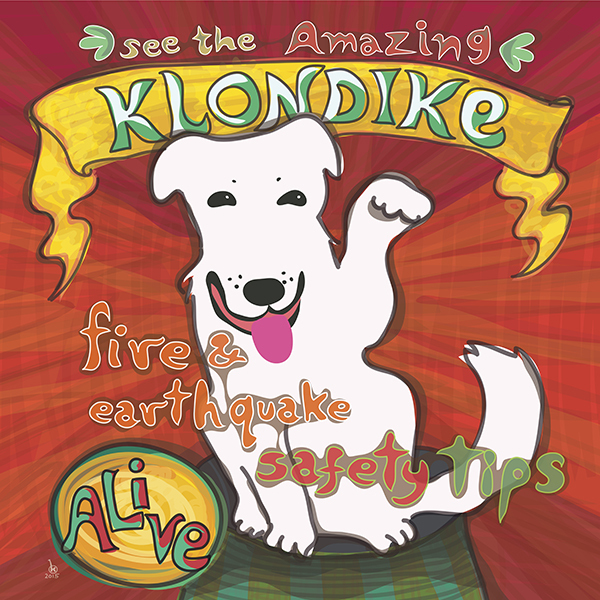 Klondike donated his time to share valuable safety tips with our guests on the Fourth of July. 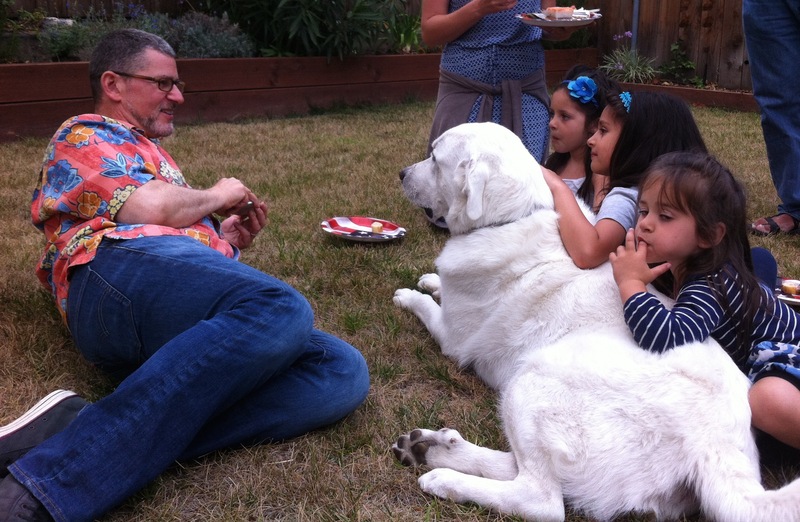 Aware of his hosting duties, Klondike served as a pillow for some of our younger guests. Yellow grass brought to you courtesy of the California drought. Klondike Makes The Front Page and Gets Styled! Read all about it! 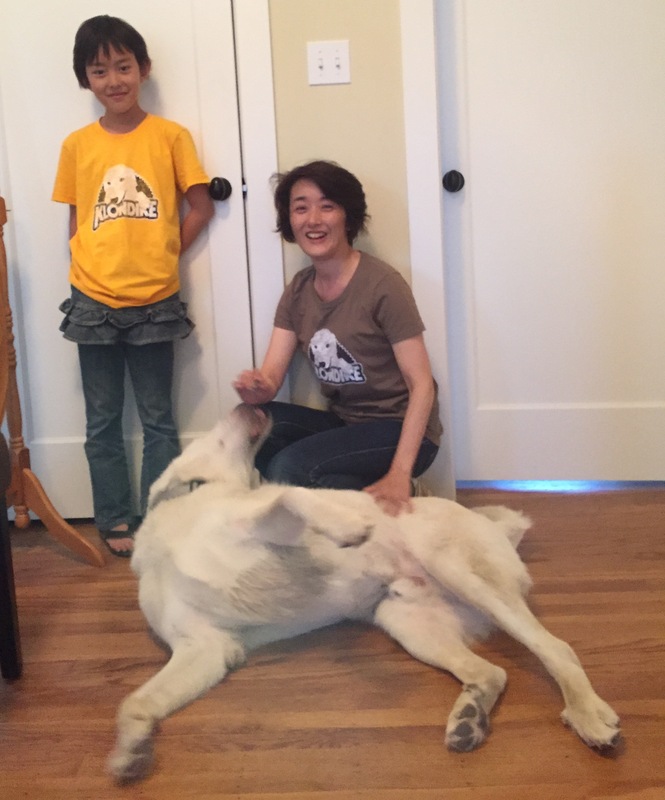 Klondike was delighted to be featured in the Spring 2015 edition of the PIDO Pointer, the official publication of the Point Isabel Dog Owners Association, courtesy of Marla Miyashiro. Check out the in depth interview with Klondike (really) – it’s a pretty tail thumping read, if Klondike doesn’t say so himself! And speaking of Point Isabel, that’s Klondike you see above taking a restorative swim and dust bath between rounds of gopher digging, ball borrowing and chase playing. I regret not having any good before and after photos of his dirt rolls. In the course of maybe thirty minutes he went from bright white to brown, to black and cream. Interestingly, each dip in the water also seemed to raise his energy level. When we first arrived in the park he was in full Pyrenees mode. Polite, friendly, willing to be sniffed and sniff back, but much more interested in a slow and deliberate cruise around the park than vigorously playing with other dogs. Then he went into the water and emerged energized, ready to run and jump with any large dog at the park. Then he went in again and came out yet more pumped, and ready to run any dog who would play. It was pretty amazing watching his energy meter fill up! And while there is no greater pleasure than watching a happy dog, having a wet, dirty dog to transport home by car is not what most people would consider a fun activity. And to make matters worse, I had forgotten to bring a beach towel with me. So my choices were putting a sopping wet, muddy dog in the back of the car, or rinsing Klondike off with the hose, which he hugely dislikes, and then putting a clean(ish) but soaking wet dog in the back seat. 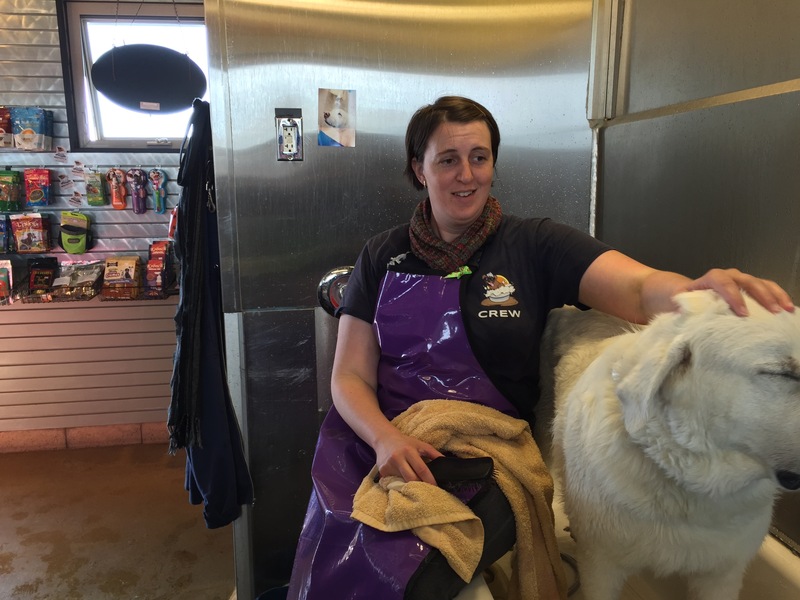 After some thought, I chose plan C.
Mud Puppies Tub ‘n Scrub, the on-site groomers at Point Isabel and home to Katie, one of Klondike’s personal stylists. Yes, that is Katie you see above in the purple apron, Klon you see in the white fur and Klondike’s picture decorating the wall. Klondike’s life is not limited to press interviews, outdoor sports and beauty treatments. He also has a very serious side. He’s back in school, enrolled in BravoPups! Talent class, a basic introduction to performance. And this is Sandi of BravoPup! doing some one-on-one instruction with Klon. Gotta give the beast credit.. he knows how to stay hungry and focused!